The Galigeo solution integrates directly into your CRM tool. 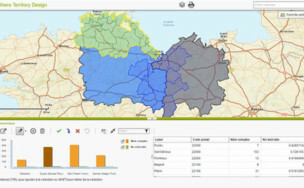 As a result, your sales staff out in the field can view their key data on maps so that they can organise and optimise their sales activities. And at the end of the day, you get improved customer relations and easier sales management. Streamline your journeys and determine which leads to visit. Determine sales priorities and develop your target territories. Get an overall view of the business and tailor your operations. 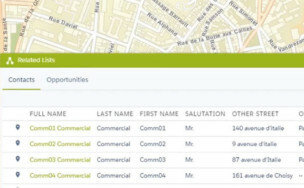 Geocode accounts, contacts, leads and any other Salesforce object. Correct their location directly on the map simply by dragging and dropping. Assess the potential of your territories and identify under‑exploited areas. Make quick decisions by monitoring your key indicators (turnover, socio‑demographic data, customer attrition, etc.). Precise prospecting in a given territory. Optimise itineraries around meetings by car or on foot. Integrate your events in the schedule in your Salesforce CRM tool. View your routes day by day. Locate leads close by and optimise productivity by using customised routes. 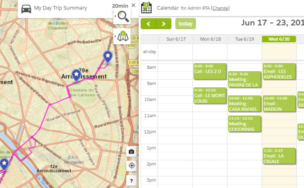 Launch your itinerary to the next meeting in real time with Waze or Google Maps. Call your contacts via the app to enhance customer relations. Your client portfolio will change, as will your sales teams. Be reactive! Exploit the potential offered by mapping and the cloud to quickly adapt your sales organisation to changes. Create balanced sales sectors consistently and effectively according to turnover or number of accounts. Assign clients and leads to vendors en masse. Get an overview of your sales activity with the simple, easy‑to‑read interface. 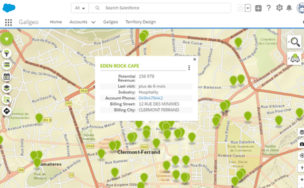 At a glance, mapping reveals key information from Salesforce. Carry out everyday tasks: create opportunities, contacts, etc. Browse your Salesforce data by displaying linked objects and their fields. 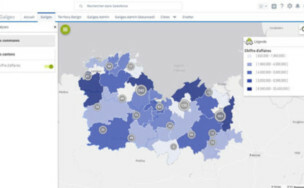 Big data comes to the rescue of sales territory mapping for General Electric Healthcare, a world leader in the manufacture of medical imaging equipment. The power of mapping as a sales visit plan. With Galigeo’s sales prospecting tool, the Giropharm network of pharmacies creates balanced sales territories. 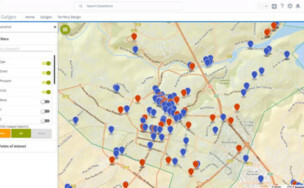 Boosting CRM adoption with location intelligence. 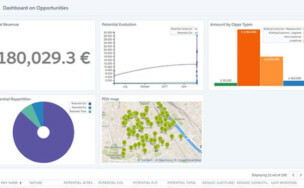 With the implementation of Galigeo for its CRM in SaaS mode, Salesforce, Heineken’s sales force is finding client data easier to use and a lot more user‑friendly. Would you like to know more about our location intelligence offering?